Try This At Home | Oh, hello thirty. True confession. I live in a one bedroom apartment with my husband and two cats. It’s a little crowded, a little cozy and sometimes, well, it’s a little stinky. Our kitchen and dining area have no ventilation and cooking smells tend to linger. It’s not that I don’t love the smell of bacon, but day-after bacon? Not so much. Thankfully, a few years ago one of my best friends taught me her Mom’s secret trick for de-stinkifying her home. It’s so simple I can’t believe I didn’t think of it myself. You just fill a pot up with water, add some goodies, turn on the stove and simmer everything until your entire home smells amazing. 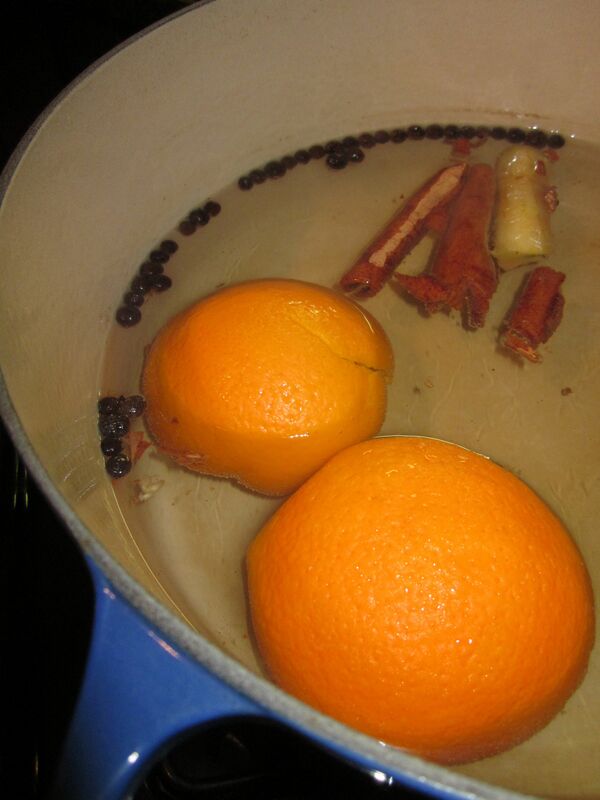 Personally, I’m a fan of fruits and spices – here I’ve used an orange peel, an apple core, some cinnamon sticks and whole allspice. Make sure to check back in periodically and add water when necessary so that you don’t scorch your ingredients. Obviously, the bigger the pot of water the longer you can let it be. I prefer using a huge pot – generally my gigantic Le Creuset. I fill it to the top, turn the stove on low and forget about it for hours. When my whole apartment smells unbelievable I turn off the heat, cover the pot and leave it there to use again the next day, and sometimes the day after that and the day after that! I love this method. It’s simple, it’s natural and it uses ingredients I have on hand and many that I would otherwise throw away. Thriftiness makes my inner Iowan grandmother so very happy. Plus, if you’re feeling uninspired the internet has some great suggestions for scent-combinations. The Yummy Life suggests lime, thyme, mint and vanilla extract; One More Moore shares the secret behind Williams Sonoma’s awesome smell (lemon, rosemary and vanilla); and Inspired To Share recommends pine, bay leaf and nutmeg (year round Christmas!). Would you try this at home? What scent would you chose?